Like Water for Chocolate is a great book and I like the author's writing style. (It is) great that she puts a story behind each recipe. My favorite recipe (story) was the "Quail in Rose Petal Sauce" because she did not throw away any part of the roses and she made a wonderful dish. It is a bit of a sad story but overall a really good book. Like Water for Chocolate is a book full of forbidden love, passion, marvelous recipes and even some home remedies. In this book, Tita, the youngest of the girls, fights for what is right. Learning that she will forever be alone, Tita begins to revolt against the family until, after many years, she finally wins by loving Pedro so much that they both perish. It may end like this, but they will always be together now, and that turns this tragic story of Tita into a romance novel. I like[d that] Tita created and then made all of the recipes [in the book]. I [did not] like how the family was arranged [and how the youngest daughter had to take care of the mother forever]. [I thought] that the part [in the story where] Mama Elena had her [secret] child that was [said to be her] childrens' nephew [was interesting]. 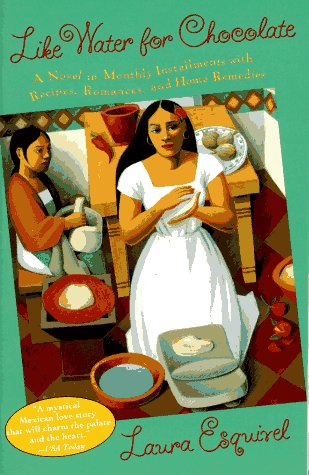 [This book] is tall tale, fairy tale, soap-opera, Mexican food cookbook, and home remedy book all rolled into one. It is also a wondrous romantic novel.